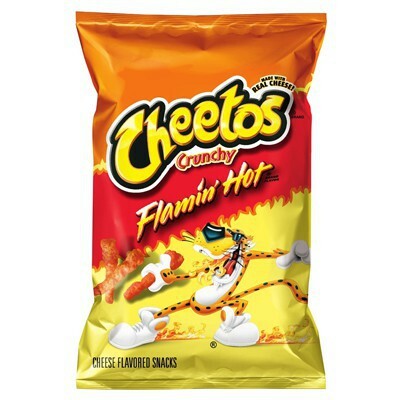 ¡Imposible comer de incognito estas patatas chips Cheetos Flaming' Hot picantes! ¡Tus dedos naranjas y tu boca sacando fuego te van a traicionar! De todas maneras ¿qué importa? ¡hay suficientes para todo el mundo con su formato familial...! Declaración nutricional (para 100g): energía 571Kcal, grasa total 39.3g (cuyo grasa saturada 5.4g), carbohidrato 46.4g (cuyo contenido de azúcares 0g), proteínas 3.6g, sal 2.2g. I have seen this cheetos in a few travels to US but like my tittle wasn’t the mos spicy I am still prefer the xxtra hot from the same brand. Anyway you can enjoy the flavour in every bite! I love having red fingers! One of the best chips.. This is definitely one of my favorite chips.. it's like being back in America again. Je n'avais pas eu l'occasion de les tester pendant mon voyage aux US, mais leur réputation les précédant j'ai voulu tester et ça a été rendu possible avec ce site! Un des snacks favoris de la famille. Super piccanti e super buoni per qualunque palato. Ever since I came back from the states I’ve been craving hot Cheetos and I’ve tried to find them everywhere. I even looked on eBay and Amazon but none of them delivered to Europe in under 100$. MyAmericanMarket is so inexpensive and delivers fast! Ci credo che gli americani ne vanno pazzi!!!! My favorite snack from US. I am so happy I can finally enjoy it in Spain. If you like spicy snacks, this is a must try. ça pique et j adore ça!! à tout ceux qui aime le piment à consommer avec ou sans modération!! Hot Cheetos are easily the greatest snack food ever created. It's difficult if not impossible to find these in Europe. I'm so chuffed you guys sell these! The shipment went out in good time, and it was packaged nicely. I'll be buying again (real soon...)! The delivery was very fast (to Germany)and the chips came packaged very well. Thank you! I'm an American living in Germany and I couldn't find the right source for American junk food until I stumbled upon this website. I ordered a few things the price is okay and the delivery took a week. All in all am very satisfied with service. The delivery was fast and the chips came packaged very well with a few extra dum dum pops inside ! Finally can enjoy them abroad, great snack and good delivery service. Every time I check there are none in stock. I love these so much. The last time I bought it I bought 4 bags. Please bring them back. I am dying to eat them! So happy I can finally enjoy it in Germany !